This part is dedicated to Closed Box (CB) design. We have already chosen our loudspeaker drivers and therefore have their datasheets along with their dimensions and TS (Thiele Small) parameters. We also have a rough estimate of the required (internal) volume of our CB enclosure. There are several pieces of software that simulate the low frequency behaviour of woofers in Closed Box designs, giving estimates of system SPL responses in the range 10Hz-1000Hz. Some of them attempt to simulate the effect of the diffraction SPL step (or loss) that rises from the finite (not very large as in the case of the infinite baffle condition) dimensions of the enclosure. -Can we just start using such a simulation program and let all the theory of the past decades aside ? The answer is no, as far as I am concerned ! Because using such a software involves decision-making concerning too many possible changes in enclosure dimensions and driver placement coordinates. Deep knowledge of the underlying theory helps us understand which parameter must be altered to get the desired change. - woofer TS parameters ? - approx. enclosure volume requirement ? The heart of our approach is the fact that the shape of the SPL response at very low frequencies is that of a Second Order High Pass System as explained in a previous tutorial. Second Order responses feature a (total) quality factor which decides their exact shape. 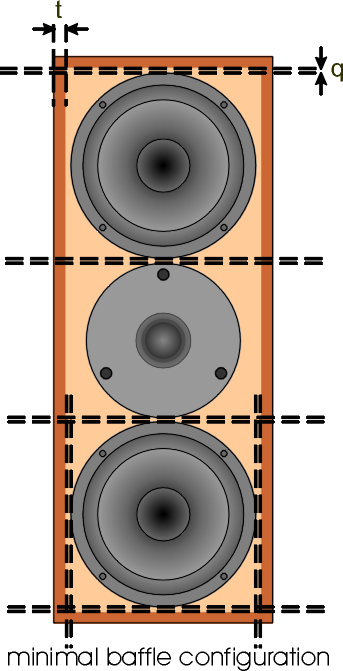 Decades of speaker design were based on the theoretically ideal value of 0.707.
peak SPL: estimated peak response value (dB) with respect to flat alignment. Qtc: overall quality factor of woofer cone oscillation with driver mounted on final enclosure. Its value affects bass response and control. * Theoretically should be set to 0.707. * SPL response curve becomes less steep for values less than 1.0. * Values more than 1.2 produce detectable bass response peaks of more than +2dB. * We suggest a moderate value of Qtc=1.0. As explained in the diagram on the right, parameters in red are input while those in blue are derived by the design formulas presented. These formulas were produced by Garry Margolis in 1981 in JAES (Journal of the Audio Engineering Society) and to our opinion constitute the most practical design procedure we can get from mathematical analysis of woofer suspension mounted on a speaker enclosure. Let us have a look: We first decide whether our enclosure is adequately filled with sound absorbing material. This affects sound propagation (gamma) as well as wave losses within the enclosure (which form the quality factor Qa due to absorbing material). We have set the overall quality factor's target Qtc to a value of 1.0. We 'substract' Qa from target Qtc and get the quality factor Qtc' that our woofer should present along with enclosure's air. L and a are intermediate variables that finally derive the necessary internal cabinet volume Vb. Resonance frequency fc is also derived though unimportant. Usually fc is larger than driver's free air resonance frequency fsb. Cutoff frequency f3 is then calculated along with the expected SPL response peak and the maximum RMS power this design can withstand in order for the vibration amplitude not to exceed the driver's limit Xp. If this RMS limit in Watts is more than what the woofer driver can 'thermally' undertake we must not take it into account. The most important variable derived by these formulas is the required net enclosure (air) volume Vb. If we choose to use a different value, larger than the calculated one, we will end up with a lower cutoff frequency (that is good) and a lower quality factors Qtc' and Qtc. This will sustract some bass response around the cutoff frequency (that is not good). It's a compromise that must take place in our mind and our choices. If we choose to work differently and set Vb to an arbitrary value we can still use these formulas in the reverse order: use Vb to calculate Vab, then use Vab to calculate a, then use a to find L and L to get Qtc'. Finally compute Qtc from Qtc' and use the latter to get A1. Cutoff frequency f3 and peak SPL are then derived as before. -Is that all ? Are we done ? We create a drawing of our baffle dimensions with the minimum values we can have. We call it the minimal baffle configuration. As shown on the picture on the right, we place our tweeter and woofer drivers as close as possible to enclosure walls and to each other. We define a proximity clearance for all baffle objects : q=5mm. Vb / Minimal Baffle Area. The idea is simple: This value is actually the largest depth we can have in this speaker's cabinet design because we have assumed the smallest baffle configuration.We should make sure that this maximal Enclosure Depth is feasible. For example let us take the case of a small CB design where this depth is found to be 132mm whereas the overall woofer chassis depth is 133mm. Obviously woofer's magnet can not break through the enclosure's back wall. The Required Enclosure Depth is not feasible : our minimal baffle configuration is too large : our drivers are too large for the net volume Vb we need. -How do we check for the feasibility of the Required Enclosure Depth ? We create a drawing of the side view of our enclosure with the minimum dimensions we can have. We call it the minimal depth configuration. As shown on the picture on the right, we place our tweeter and woofer drivers as in the minimal baffle setup and define a proximity clearance p between the enclosure's back wall and any baffle object. Though p can be arbitrarily selected we choose its value to be 1-2cm. We also observe that for each driver a part of its overall chassis depth is actually fitted in the baffle's wall thickness t. So within the enclosure only a length equal to (driver depth - t) really exists. This is the absolutely minimum depth value we can get with these drivers. In that sense this value should not exceed the Required Enclosure Depth we evaluated in the previous step. If this happens no design can be achieved unless we increase the required net volume Vb or simply change our selection of drivers. In closed box design this is rarely a situation to deal with and it can be treated by a small change of Vb. However one must not forget that crossover PCB's and binding post terminals also need need space to be accounted for. Very small speakers are very difficult to design. -How do we apply these principles for a CB speaker having two or more woofer drivers (and a midrange in a three way system) ? -So what is next ? Minimal Baffle Height and Required Enclosure Depth as a start. 1.Width, height and depth are inversely proportional variables for the net volume Vb to be kept constant. Therefore an increase of any of these three variables should be compensated by a decrease of anyone of the other two. 2.Diffraction step loses its strength when baffle dimensions increase. Small baffle widths lead to loss of woofer very low frequency SPL response and to increased tweeter SPL irregularities. 3.Enclosure (inner) depth should never equal baffle (inner) width. Standing waves within the enclosure become very strong for the absorbing material to deal with effectively. It is also a matter of speaker cabinet elegance. We usually make speaker depth more than 20% larger than its width (Depth/Width more than 1.20 and less than 1.80). 4.The distances of a tweeter's center from the three nearby baffle edges should not be equal. This would create a strong diffraction and thus a very irregular SPL response. For this reason tweeters are usually placed in an asymmetrical way on the front baffle. 5.Tweeter's center defines speaker reference axis which is generally expected to point to the typical listening position. Therefore tweeter's height should match listener ears' height from the floor. It is a good idea to set that height to 105-115 cm from the floor. Needless to say that in special design situations this height can be varied accordingly. 6.Woofers should not be placed at low heights above the floor. Their interaction with it creates severe artifacts at very low frequencies. In addition the overall speaker impression is not nice (to put it in a gentle way). 7.Keeping woofer, midrange and tweeter centers as close as possible eliminates spatial image smearing at high quality recordings of human voices and/or solo wind instruments. 8.In baffle design whenever technical reasoning compromises speaker elegance, failure is the outcome. At this point the low frequency design procedure comes to its end. Inner and overall enclosure dimensions have been determined and placement of all front baffle objects (drivers) has been concluded. 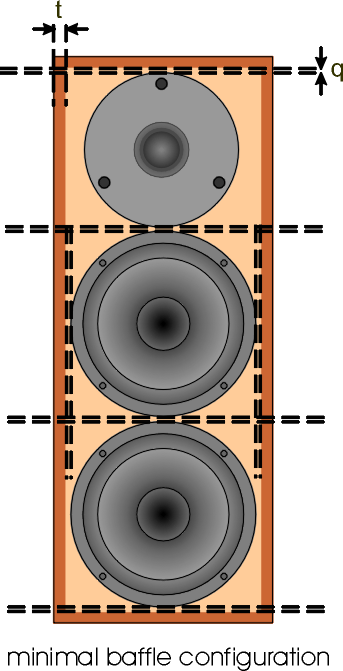 An accurate technical drawing of our speaker cabinet should be issued and printed as an image or a .pdf document. All dimensions, distances, details, material specifications and special assembly instructions (if any) should be included even if this turns out to be a multiple page document. It will save valuable time and money resources to help your 'wood expert' not provide his/her own solutions to questions raised during the cabinet construction process. Apparently your drawing should not allow for multiple interpretations at any point or detail. Even if it doesn't sound well I strongly advice that your drawings have a version number and a date of issue. A drawing that evolves is a natural thing in speaker design.